Chef Richie Nakano has been promising the city a permanent home for his Hapa Ramen pop-up and farmers' market stand since the first Obama Administration, and it is finally, finally happening on Sunday. As Inside Scoop succinctly puts it: "Brace." We are a town that's been, in recent years, starved for ramen. The craze hit New York approximately around the time that David Chang opened Momofuku Noodle Bar in 2004 but was very slow to make its way west. That all changed when Nakano left the line at Nopa to start his own ramen business in 2010, and with the subsequent openings of places like Ken Ken Ramen, Nombe, Namu Gaji, and the 2013 opening of Ramen Shop in Oakland. 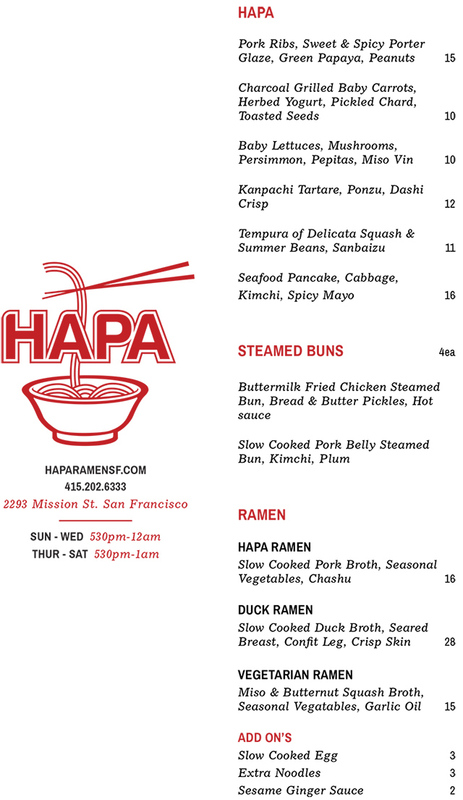 There were immediate lines greeting the opening of Orenchi Ramen in the Mission last month, and now Nakano as arrived with even more competition, with the opening of Hapa Ramen at 2293 Mission Street (between 18th and 19th) slated for Sunday, November 23  just in time for winter. The full Hapa Ramen menu is below, and what sets Nakano's stuff apart are the "hapa" flourishes like buttermilk fried chicken steamed buns and "cheeseburger ramen" (not offered on the opening menu), not to mention his excellent tonkotsu pork broth, and his duck ramen with crispy duck confit leg and slow-cooked duck broth. 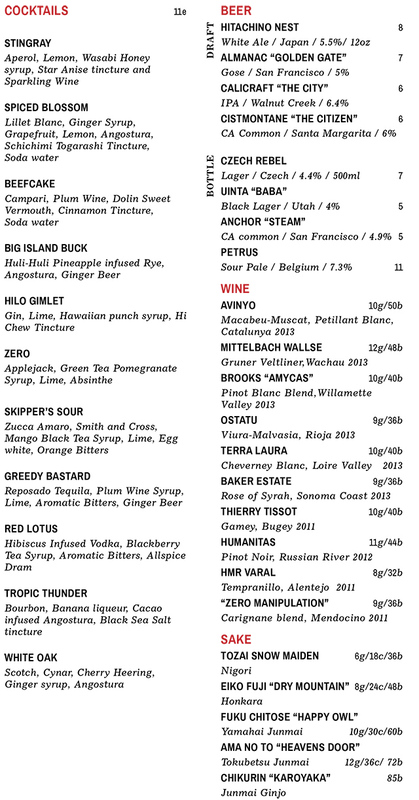 Also, this is officially the only ramen spot in the Mission with a full bar, and the cocktail menu is also below. See some preview photos of the space here. Expect lines, and at least to start, there will be no reservations taken.